I really want my students to have stronger questioning skills, I think that by giving them practice at answering better questions and generating better questions about their work they’ll begin to develop a deeper understanding of their subject. Towards these ends I’m collecting & creating resources for me to use in both planned ways and more ad-hoc ways in my lessons with students. You may have seen the earlier post on the Thinking Dice, and their use to generate questions using Blooms Taxonomy (for generating questions) as a basis, well coming out of my work on the Outstanding Teacher Programme last term I’ve sat this evening and created a new resources using questions based on Blooms. 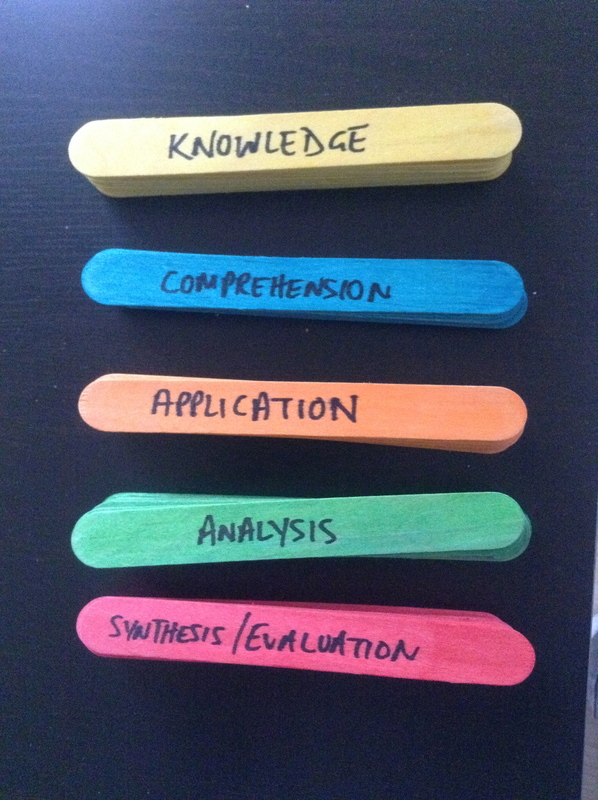 I ordered a pack of large coloured lollipop sticks via Amazon last week, I’ve then been splitting up the aspects of Blooms Taxonomy & as you can see from the pictures, added example questions to each stick. The idea being I’ll allow students to draw sticks from a pot during lessons and generate personalised homework/lesson time questions from these! I’ll see how it goes, but the important thing for me as a teacher is it’s another resource to keep with me and help me maintain engaging lessons which keep pupils on the edge of their comfort zone and moving constantly towards their targets! Hope the idea is useful to others out there!